A face mask is typically used to correct skeletal imbalances such as an underbite, in which the lower jaw sticks out farther than the upper jaw. The method used to fix this problem involves moving both the upper teeth and jaw forward using this particular device. 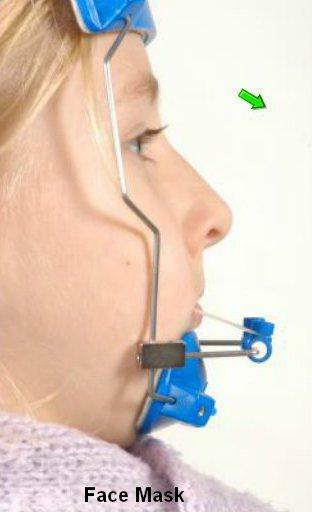 To place it, the face mask will be attached to a palatal expander using rubber bands. 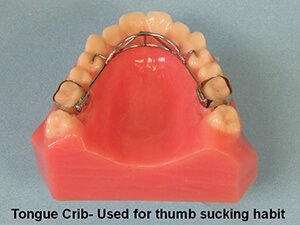 A patient will then need to wear this device for 12-15 hours a day until their bite has been realigned. The treatment can also be used in tandem with TADs for more extreme misalignments. Thumb or digit sucking for an extended amount of time can dramatically affect the development of a young patient’s teeth and jaw. A habit appliance can be used to prevent this, and it works by cementing it to the upper molars so that a child cannot stick their thumb or finger into their mouth. Eventually, a child will naturally stop this habit, and this will either allow their teeth to develop correctly, or Dr. Mason can then begin treatment. A palatal expander is used to widen the hard palate (upper jaw) so that the upper and lower teeth can fit together correctly. In younger patients, the upper jaw is actually composed of two separate bones that are connected by a thin suture right in the middle. These bones fuse during the early-middle teenage years, meaning they can be more easily modified while a patient is still young. 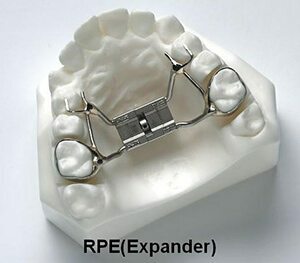 A palatal expander is a small bar that is anchored in place using rings around the upper molars. This bar can actually be expanded gradually using a small key that fits into it. In order to get the proper expansion of the palate, the key must be turned once a day, every day until it is sufficiently widened. This can sometimes create a space between the front teeth, but this can be easily closed with braces. Even after the appropriate palate size has been achieved, the expander may need to stay in place for several months until the jawbone has had time to mature. 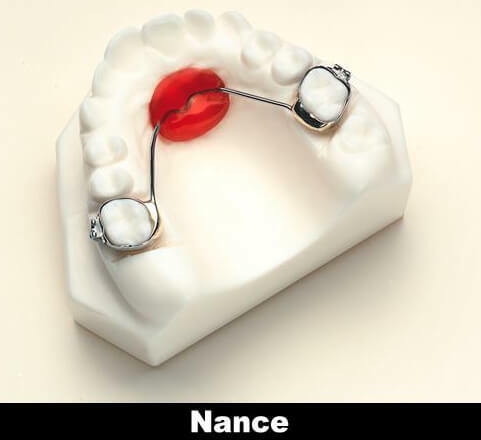 This device is used to maintain the position of the lower adult molars as the primary (baby) 2nd molars are lost. The adult teeth that will replace these primary teeth are actually smaller, and this holding arch will help make sure that they can erupt correctly. It will prevent the back molars from shifting forward, and this can help alleviate or even prevent the teeth from becoming crowded. It may also be used if the primary teeth have been lost too early in order to maintain the space for the adult teeth to erupt. 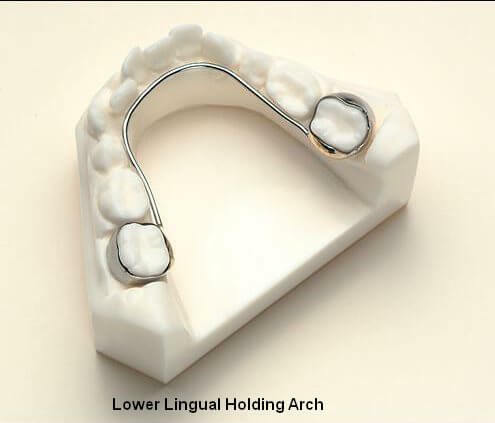 This appliance is very similar to the lower lingual holding arch, except it is used for the upper jaw. Once again, its primary objective is to keep the space left by the missing baby teeth so that the adult molars can come in straight. 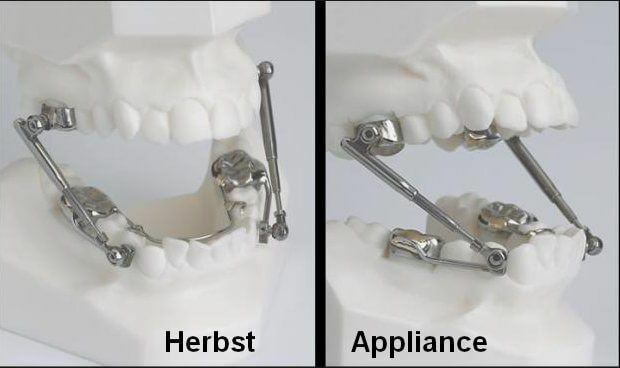 The Herbst appliance can be used to help correct an overbite, which is a skeletal imbalance where the lower jaw is positioned too far behind the upper jaw. It will be affixed to a patient’s molars, and it will consist of metal tubes that connect the jaws together. These tubes can be adjusted by Dr. Mason to help correct the relationship between the jaws. 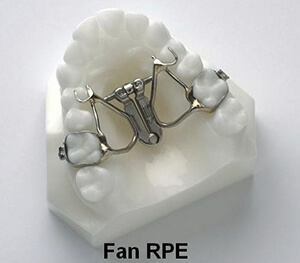 Typically, a patient only needs to wear the Herbst appliance for 12 months to fully correct the problem. Afterward, it may be necessary for a patient to undergo further orthodontic treatment using braces or Invisalign. 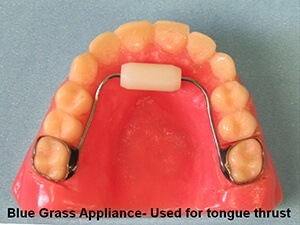 The Forsus appliance can also be used to help correct an overbite (or class II malocclusion), and it works by using a non-compliance spring in conjunction with braces and wires, replacing the need for elastics. 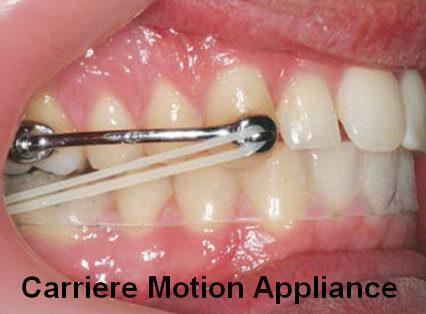 The Carriere Motion appliance can be used to turn a difficult class II patient into a simpler class I patient by helping limit the need for tooth extractions. This device can be used with both braces and Invisalign, and it has a very low profile which is very comfortable for patients.